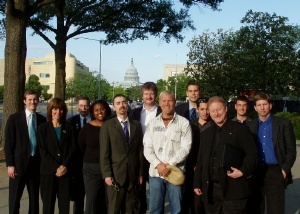 June 2006: As the congressional markup of the NASA budget approaches, the Space Exploration Alliance (SEA) launched its 2006 Space Blitz on Congress demonstrating grassroots, citizen support for space exploration. The alliance is a partnership of the nation’s premier non-profit space organizations with a combined membership of more than 100,000 people throughout the United States. The SEA Space Blitz is a legislative outreach event that brings together ordinary people from around the country to voice their support for the Vision for Space Exploration and for full funding of a space program that the United States can be proud of. The participants donate their time and pay their own way to the event based on their belief that the nation must continue to lead the future of space exploration and development. The Alliance includes the American Astronautical Society, American Institute of Aeronautics and Astronautics, Aerospace Industries Association, Aerospace States Association, the California Space Authority, Federation of Galaxy Explorers, Florida Space Authority, Moon Society, Mars Society, NASA Alumni League, National Coalition of Spaceport States, National Society of Black Engineers, National Space Society, The Planetary Society, Space Access Society, the Space Generation Foundation, and the X PRIZE Foundation. The main focus of this year’s event is to request that Congress fund NASA at the full authorized level of $17.9 billion, which would require an additional $1.1 billion over the President’s request. This level is required to enable NASA to implement the full mandate of the 2005 NASA Authorization Act, in which Congress endorsed the Vision for Space Exploration. Specifically, the additional funds will allow NASA to aggressively develop the next generation of space exploration vehicles, while pursuing other important objectives like: Connecting upcoming lunar exploration work with future human exploration of Mars; stimulating private sector efforts with programs like Commercial Orbital Transportation Services (COTS) and the Centennial Challenge program; and sustaining vital science missions, including the Terrestrial Planet Finder (TPF), a dedicated probe of the Planet Jupiter’s moon Europa, and the Stratospheric Observatory for Infrared Astronomy (SOPHIA). During the blitz, organizers plan to take these messages to the offices of the members of the House Committee on Appropriations, plus key members of the Senate Committee on Appropriations and other Congressional leaders. The 2006 Space Blitz represents the third straight year that SEA has come together to demonstrate its support for space before Congress. It is also the second in a series of four legislative programs that SEA is planning for 2006.